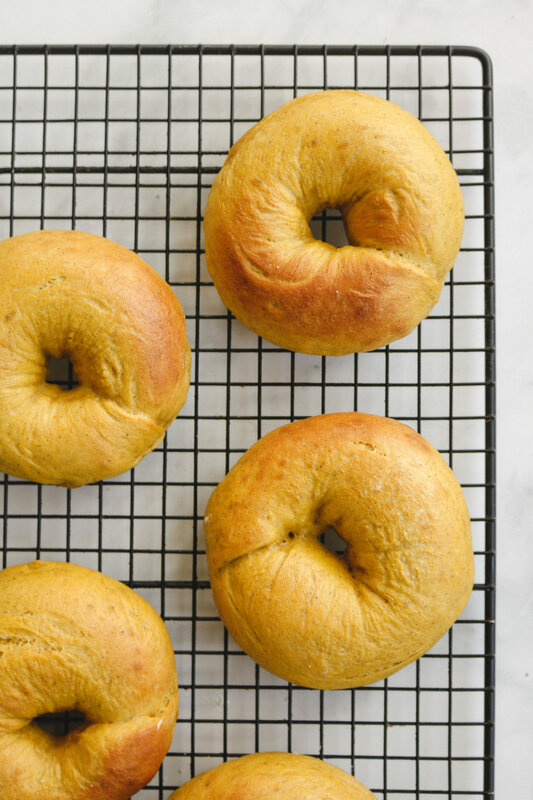 These Kabocha Bagels with Maple Cinnamon Cream Cheese is a delicious twist on the classic cream cheese bagel, perfect for cold winter mornings! Oh, and of course they are 100% vegan! I really don’t have anything to say about this recipe other than that you NEED this in your life. Bagels are one of my favourite breakfast foods and kabocha is my favourite squash of all time so naturally, of course I had to combine the two. Oh, can’t forget the cream cheese. Cream cheese is a must and I’ve made this practically every week since posting the recipe! Okay, enough rambling, lets get right into it. 6 ingredients ya’ll! I know a lot of people find making bread and bagels intimidating but it’s really not hard at all, it’s just a lot of waiting time! But I promise, ITS SO WORTH IT. & makes the most comforting breakfast meal! Depending on how moist your kabocha is, you’ll need more or less water. Once you steam/nuke the kabocha, you’ll be able to tell how dry it is when removing the peel. Start with 150ml of water and then let the bread maker go. You’ll know if its too dry if its having a hard time mixing the ingredients. Add a table spoon of water each time it turns until it starts forming a dough. When forming the bagels, pinch the ends down together slightly so it doesn’t unravel when boiled in the water. The cream cheese should chill in the fridge for atleast an hour before eating as it’ll change the flavour and make a more realistic cream cheese like texture. Freeze the bagels to keep them fresh & defrost the morning of then ready to use. 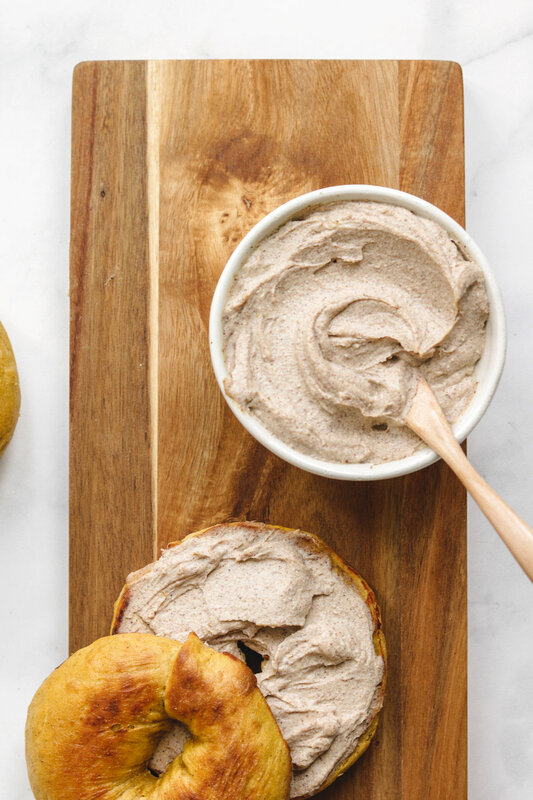 If you recreate this Kabocha Bagels with Vegan Maple Cinnamon Cream Cheese please share it and let me know what you think by tagging me on Instagram @lisakitahara, I love seeing all of your tasty recreations! * Use bread maker dry yeast if you’re using a bread machine maker. If kneading with your hands, use regular dry yeast and dissolve in water first. Place all ingredients into a bread maker and let it knead for 15 minutes or until done and has risen (around 10 minutes of sitting time). Watch it knead for the first few minutes and add in a little bit of water as needed if it looks too dry. If making by hand, mix and knead the dough until all the ingredients are incorporated and form it into a large ball and let it sit covered until ball doubles in size. Flour the surface your working on and your hands. Punch the dough down and take it out onto your working surface. Knead with your hands a couple of times. Divide dough into 5 bagels and form them into balls. Let them sit for 10 minutes covered. Roll the dough out and form them into bagels. Cross the tips and fold under to attach the ends to keep their shape. Cover and let it sit for 20 minutes. In the meantime, heat up some water in a large pot or wok with 1 tbsp of water. Bring heat to a strong simmer. Pre-heat your oven to 200C. Boil the bagels on each side for 40 seconds each and transfer them onto a lined baking tray. Place them into the oven for 15 minutes rotating the tray half way. Let them cool on a cooling rack once they’re out of the oven. For the cream cheese, mix every 1/4 c of cream cheese with 1/2 tbsp of maple syrup and 1/4 to 1/2 tsp of cinnamon until smooth. When serving, slice the bagels in half and spread cream cheese over. For storing, freeze bagels. Store cream cheese in airtight container for up to 1 week.